U.S. aviation officials on Monday (December 30, 2013) named the winners of a high-stakes contest to operate one of six new research and test sites for unmanned aircraft. The Federal Aviation Administration (FAA) will now work to help the sites set up safe operations and create the structures needed within the agency to help it use the sites’ research results. The designated organization — located in Alaska, Nevada, New York, North Dakota, Texas, and Virginia, which is partnering with schools in New Jersey and Maryland — are each operated by a public entity. They were chosen in part for their diversity of climate and geographic location as well as the infrastructure available on the ground, said FAA Administrator Michael Huerta in a telephone news media conference. Testing done at the sites will be used to develop the certification and operational requirements for using an unmanned aerial system (UAS) in the United States and will help officials find solutions for key questions such as how to achieve “sense and avoid” in an unmanned craft in which GNSS positioning is expected to play a key role, handle command and control, set ground control station and airworthiness standards, and devise rules for human factors, the interface with the air traffic control system, and procedures when a communication link is lost. The competition was fierce for what is widely seen as a critical leg up in a lucrative new business sector. The Association for Unmanned Vehicle Systems International (AUVSI) said earlier this year that activities surrounding UASs would create more than 100,000 high-paying jobs. AUVSI forecast an economic impact of more than $82 billion for the country in the first decade after the aircraft are integrated into the National Airspace System or NAS. 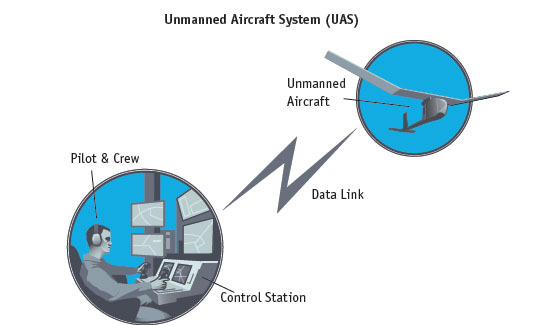 Congress in the 2012 FAA Reauthorization Act charged the agency with integrating unmanned aircraft by 2015. Alhough the overall process has been delayed — in part by concerns that unmanned craft could be used to invade personal privacy — the new test sites are expected to move the process along and help companies profoundly long frustrated by a lack of testing opportunities. One of the sites is set to begin operations within six months, although Huerta declined to say which facility would be the first. The sites will continue their research through at least February6 2017, which is when the FAA Reauthorization Act expires. The University of Alaska proposal was chosen, the FAA said, because it offered a diverse set of test site range locations in seven climatic zones as well as geographic diversity provided by the test site range locations in Hawaii and Oregon. The university’s research plan includes the development of a set of standards for unmanned aircraft categories, state monitoring, and navigation as well as work on safety standards for UAS operations. The state of Nevada plans to concentrate on UAS standards and operations at its site as well as operator standards and certification requirements. It will look at how air traffic control procedures will evolve with the introduction of UAS into the civil environment and how these aircraft will be integrated with NextGen, the FAA’s next-generation air traffic control system. Huerta noted that Nevada’s selection brought a test site to the southwest part of the country. The site at New York’s Griffiss International Airport will tackle developing test and evaluation as well as verification and validation processes under FAA safety oversight. It will focus on researching sense and avoid capabilities and help research the complexities of integrating UAS into the congested, northeast airspace. The North Dakota Department of Commerce will use its site to develop essential UAS airworthiness data, validate high-reliability link technology, and conduct human factors research. This site, the only test range in the temperate (continental) climate zone, also includes a variety of different kinds of airspace. Texas A&M University at Corpus Christi plans to develop requirements for UAS safety and unmanned operations at its site, with a goal of supporting protocols and procedures for airworthiness testing. Virginia Polytechnic Institute and State University, also known as Virginia Tech, plans to conduct UAS failure-mode testing and identify and evaluate operational and technical risks areas. Its plan includes test ranges in New Jersey as part of a cooperative arrangement with Rutgers University. The University of Maryland has also agreed to partner with Virginia Tech and Rutgers on UAS integration. “With our partners, we firmly believe we can introduce this new technology the right way,” said Jon Greene, interim director of the Mid-Atlantic Aviation Partnership and an associate director of Virginia Tech’s Institute for Critical Technologies and Applied Science in a prepared statement. Virginia announced earlier this month that it was awarding more than $2.6 million over three years to Virginia Tech to operate the Virginia test site. Each site operator will need to find its own resources as the FAA will not provide funding for the sites although Congress could potentially find some money for the research and test activities down the line. Although the sites will be helping FAA establish UAS operational guidelines, equipment standards, and certification, they will likely be a boon for American companies, which have been very vocal about the difficulty of obtaining access to the airspace and permissions needed to test UAS in the United States, especially given that the technology is widely in use in other parts of the world. Arrangements for such testing will be left to the sites and the companies to work out. Although the six sites may now have a certain momentum, companies will likely have more than just six choices when it comes to their testing. Toscano believes that those organizations whose site proposals were not selected will continue to do research and ultimately every state may have an unmanned UAS R&D operation just like every state has a Department of Motor Vehicles. Mississippi, which has four UAV manufacturers conducting tests at Mississippi State University, will indeed carry on, said Major General James Poss (ret. ), the university’s director of Strategic Initiative High Performance Computing Collaboratory and the point person for the state’s site bid. “We’re disappointed but we’re going to continue to test,” Poss told Inside GNSS. “Mississippi State will be bidding on that along with 12 other schools in our coalition,” said Poss. Three of those schools, he noted, were part of test organizations that were selected. The COE could be “kind of the brain of the test system,” he suggested. Although the FAA has not made an official announcement about a COE, Poss told Inside GNSS the agency had previously said it would begin work on choosing a place for the COE soon after announcing the test sites. The FAA did not respond to a question on a future COE by press time. A UAS Center for Excellence could be key in bridging any gaps that might arise between the test sites and the FAA. While the aviation agency has to approve the certification standards and regulations that UASs ultimately need to operate, no process appears to be in place yet to set a research agenda or reporting deadlines. The FAA will not have staff at the six sites, said FAA spokesman Les Dorr, but will work with the sites on establishing safe operations. “We’re there to help them set things up and make sure it’s going to be safe,” Dorr told Inside GNSS. Dorr said that the six sites would be part of a “structured environment” and that the sites had to periodically report to the FAA. “These six tests sites have been specifically designated to do research that will help the FAA in integrating unmanned aircraft in the nation’s airspace,” Dorr added, noting that aviation experience was one of the criteria for selection. However, a formal structure for reporting back to the FAA — a structure that might include deadlines and feedback for the sites — is yet to be set up, he said. The sites are an essential first step, stressed Toscano. They will help determine what is necessary for unmanned aircraft to be integrated into daily life where they can be used to monitor and fertilize fields, assess pipelines, and evaluate accident sites. There are many industry working groups that have already been established and different standards that have already started to be developed, he pointed out. Data from the sites will feed into those groups, he suggested.